What began as a Dalhousie Ph.D. student's investigation into North Atlantic shark populations turned into an eye-opening discovery that shows a number of European Union-designated marine protected areas (MPAs) are falling short of protecting threatened biodiversity. The research will be published in Science this week (Dec. 21). While governments are rapidly expanding MPA networks across the globe—and that's considered a positive step for ocean health—this Dalhousie-led research team is recommending the development and enforcement of minimum biodiversity protection standards for MPA designation in light of their findings. The Department of Biology's Ph.D. candidate Manuel Dureuil, post-doctoral fellow Kristina Boerder, and Killam Research Professor Boris Worm worked with partners at GEOMAR Helmholtz Centre for Ocean Research in Germany and Halifax's Sharks of the Atlantic Research and Conservation Centre (ShARCC) on the study. The Worm Lab also has strong research ties with Global Fishing Watch (GFW) a non-governmental organization based in the U.S. Last February, the lab and GFW co-authored another Science study outlining how the use of satellite sensor data was able to quantify the global fishing footprint for the first time. Building off those findings, the Dal team was able to use the same open-access data more recently to investigate patterns of fishing effort in more detail in and around MPAs. The biologists investigated a network of 727 MPAs in European Union territory. They show that industrial fishing activity is present in at least 432 of the 727 MPAs, or 59 per cent. That's approximately 43,812 square kilometres of protected ocean. "Industrially-fished marine protected areas will not adequately protect the species that most require it, such as sharks, skates and rays. These are among the most endangered marine animals today," says first-author Dureuil, who is also president and co-founder of ShARCC. "Even though many of these MPAs were not established to protect sharks and rays, our findings question their effectiveness for biodiversity protection under current policy." The team was surprised to find that industrial trawl fishing, one of the most disruptive fishing practices, was 38 per cent higher per area in protected ocean zones when compared with non-protected zones. Dureuil was also able to show that shark, skate and ray populations decline by 69 per cent in heavily trawled areas, adding to the evidence that supports a call for improved MPA policies and minimum standards worldwide. 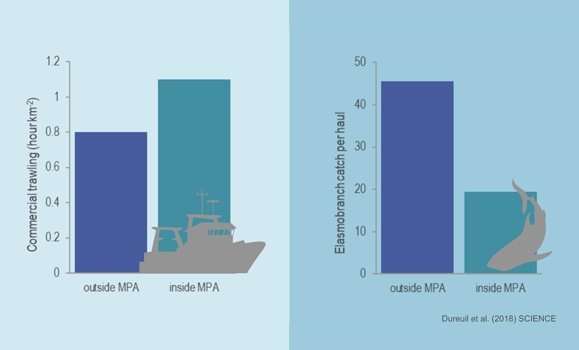 In the EU, many MPAs do not address commercial fisheries, which are mostly regulated under the EU Common Fisheries Policy. Yet all feature biodiversity protection as a cross-cutting objective. "What we're concerned about here is how strong and meaningful those protected areas really are given that a large fraction of them experience industrialized fishing," says Dr. Worm, the senior author of the study. "That pattern of fishing is quite the opposite of what we'd expect." Earlier this fall, the Government of Canada released its Final Report of the National Advisory Panel on Marine Protected Area Standards. It provides recommendations on the planning and management of Canadian MPAs, and specifically calls for improved biodiversity protection standards that exclude industrial activities from protected areas more generally. The International Union for Conservation of Nature (IUCN) also advocates for this and the implementation of enforced protection standards across MPA networks. The Worm Lab is now adding another science-backed voice to amplify the message: if a region is called a 'marine protected area' then it should, at the very least, protect the most threatened species that call it home. "There's oil and gas exploration in some MPAs, there's industrial fishing. That makes it unclear what an MPA actually means," says Dr. Worm. "When industrial use is elevated, rather than reduced in protected areas, we are not getting the conservation outcomes needed to safeguard the marine environment for the future." Endangered sharks, skates and rays are the most at-risk fish species in European territory today. Making matters worse they're often victims of bycatch, getting unintentionally caught in trawl nets that drag across the bottom, or near the bottom, of the seabed. Once entangled these fish have little chance to escape and survive. "Sharks are what first brought us to this discovery," says Dureuil. "We were wondering where the shark hot-spots are in Europe. Then, the next question was: are these hot-spot areas already protected or not?" Once he noted that many shark hot-spots were actually found outside of MPAs, he began to wonder. "The question then became: are these MPAs poorly-placed? Or is there something going on in them that sharks don't like?" says Dureuil, explaining what led him to look at industrial fishing activity within MPAs. Sitting a few feet away from him at the time was Dr. Boerder, a Ph.D. candidate at the time with expertise in MPAs and satellite-based tracking of fishing vessels. The two of them are at Dalhousie because of TOSST, a unique joint interdisciplinary graduate school with GEOMAR. Dureuil asked her to take a look at his work to investigate whether there was more industrial fishing in areas with fewer sharks, including within MPAs. Dr. Boerder's data on the spatial location of trawl fishing vessels confirmed there is indeed a higher trawling intensity in those areas. This finding had wider implications for the protection of biodiversity, explains Dureuil, because sharks and rays are sensitive biodiversity indicators: they're the first species to disappear and the last to recover. "It has been shown repeatedly that marine protected areas can successfully protect and rebuild marine ecosystems and species," says Dr. Boerder (pictured). "But in order to work they need minimum standards of protection; such as the exclusion of harmful industrial activities like trawling. We have strong safety standards for food and for cars, why not for ocean protection?" On the positive side of things, the researchers also show that lightly fished areas do allow for recovery, so there's hope to bring species back from the brink. "We're moving to stronger protected area standards on land," said Dr. Worm. We should do the same in the ocean. It we call something a protected area, it should actually be protected." The paper is titled "Elevated trawling inside protected areas undermines conservation outcomes in a global fishing hotspot."